Pixar touched the sky for the last time in 2015 with the extraordinary ‘Inside Out‘ and since then he had not managed to make any of his films round. ‘The Good Dinosaur‘ had a better script, ‘Finding Dory‘ worked as a pastime but lacked the magic of other studio titles and ‘Cars 3‘ pretty much had been a worthy sequel, which was not the second installment of that saga. I had high hopes that this “bad” streak would end with ‘Coco‘, a film that also had the incentive to tell an original story instead of being a new continuation of one of his greatest hits. Once seen I only have the possibility to return to surrender to Pixar for the wonderful movie he has done, showing his splendid sense of adventure and recovering his best weapons to cause tears to escape the eyes of the viewer. Pixar is inspired by the Mexican Day of the Dead holiday to shape the story of a child with a great passion for music who lives in a family that hates her to death. He has no choice but to act on his own, ending up in the Land of the Dead in search of the approval of his great-great-grandfather, the mythical Ernesto de la Cruz. A trip to know yourself better and that allows you to better evaluate what it means to be part of a family and the consequences of death. The script signed by Adrián Molina and Matthew Aldrich chooses to approach that from an initial lightness to evolve as the protagonist is discovering things. In this way, the viewer perceives his trip better and does so through a dynamic adventure in which many may miss a greater depth during certain minutes. I am not going to deny that this is the case, but it is that ‘Coco‘ does not want downtime and tries to go forward at all times without falling into the error of becoming a correcalles. There is no lack of more emotionally focused moments, but the dominant note is that things continue to happen, paying special attention to everything being fun, from the designs of the characters and scenarios to the lines of dialogue. They want to win us like this and then take us to their land before hitting the final blow to our heart, which is almost impossible to resist. However, ‘Coco‘ is not a movie that bets everything on that relative emotional manipulation, since above all it is a love letter to Mexican culture through its traditions. It does so by avoiding falling into the most worn out topics, since it is true that there are certain expressions or reactions that could be part of that kind of vision, but here they are integrated from a more natural perspective, making everything flow with overwhelming simplicity and little by little we have completely caught up almost without realizing it. In addition, ‘Coco‘ manages to combine tradition with a treatment of fresh and colorful history, finding that necessary balance between the need to respect Mexican traditions and the imperative that they be the basis of a story that entertains and excites us. For this reason, the creation of this world of the dead is fundamental, because when it gets there, the film takes off definitively. Before it was very nice and effective, something that is preserved to be adding new virtues almost constantly. It is fair to point out that a point has arrived in which the “tricks” of Pixar to get to the heart can be seen with some advance, something that happens in ‘Coco’. In other cases, I could have played against him, but Lee Unkrich and Molina demonstrate such ability to enhance it that it does not matter, you end up coming down as well. You know what’s coming -at least in my case-, yes, but it has such strength that it achieves its goal by far. Otherwise, it is true that there are some characters a little neglected, but its presence is just what the film needs to achieve its goal. 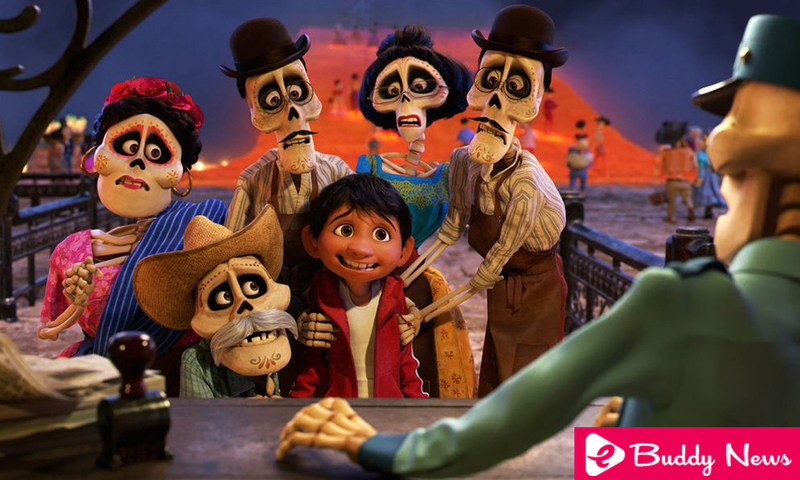 It is true that perhaps it could have gone more directly to the heart, but ‘Coco’ is also a great adventure to know both that world of the dead and more elements of Mexican culture. As such it is irreproachable, and in addition, they are planted small seeds of what is to come, is already a thing of the spectator who knows how to see them. I do not want to forget music either, the wonderful contribution of Michael Giacchino as well as some dazzling songs composed by the couple Lopez, who already worked on ‘Frozen’ and the magnificent musical of ‘Finding Nemo‘ that can See yourself in some Disney amusement parks. They even manage to give a double focus to a song that will be the one that really stays in the memory of the audience. In short, ‘Coco‘ has it all, it’s that simple. It is fun when you propose it, vibrant when you want it and you hit it in your heart when you decide that it is time to make us cry. Visually it is wonderful, fascinating when it comes to addressing the issues of Mexican culture on which the film is based and get the journey of the protagonist conquer you. So yes, Pixar.